The public sector lags behind private companies when it comes to pay packages for older workers who are rehired, the labour movement said yesterday. 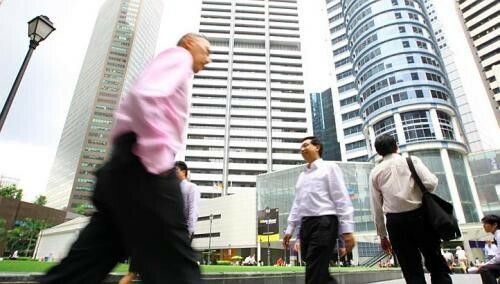 A survey of 118 firms conducted by the National Trades Union Congress (NTUC) last year found that close to eight in 10 unionised companies in the private sector did not reduce the pay of their older workers when they were rehired at 62. In contrast, public servants faced pay cuts of up to 30 per cent when they were re-employed at the age of 62. NTUC deputy secretary-general Heng Chee How produced the survey results yesterday to strengthen the union's call for change in the public sector. "When compared to the private sector, actually they (the private sector) are doing better in this regard," said Mr Heng, who is also Senior Minister of State in the Prime Minister's Office. "(The findings are) our additional basis to ask that the formula that they are currently using to determine re-employment pay be reviewed in the light of the findings for the broad private sector." Mr Heng was addressing an audience at the annual U Live Symposium organised by the labour movement. It was previously reported that unlike the public sector, the private sector tends to see cuts of 10 per cent to 20 per cent. Not all private sector workers will suffer a pay reduction when they are rehired on reaching 62. In the public sector, re-employed officers will have their salaries adjusted to the mid-point of the salary scale they are at, or 70 per cent of the last drawn salary, whichever is higher. "From the labour movement side, we are not saying that you cannot adjust pay downwards, but what we are trying to say is... the default should be to consider the value of the job and the contribution of the person, rather than the formula," he said. This is not the first time the NTUC has pushed for parity. Two years ago, unionists pointed out the difference in pay cuts between the public and private sectors - even before the law that raised the retirement age from 62 to 65 went into effect. Mr Heng said NTUC had met the Public Service Division and had shared the survey findings with it. One company that does not cut the wages of its workers when they hit re-employment age is KH Security Agency. It does not reduce wages based on age because its requirements for workers do not change. "We value the experience of the older workers who have been in the company for a long time," said senior business development manager Gary Haris. "And we keep them for as long as they can be productively employed." At the U Live Symposium, Mr Heng reiterated another push by the labour movement: Raising the age limit for re-employment from 65 to 67, to allow productive workers to continue working. This will not be an overnight change, he said, pointing out that it took four years to raise the re-employment age from 62 to 65. "The process of going from 65 to 67 will again require more learning on the ground, which is why I want the process of collecting data and learning and discussing to begin sooner rather than later," he said.